Circa 1900. 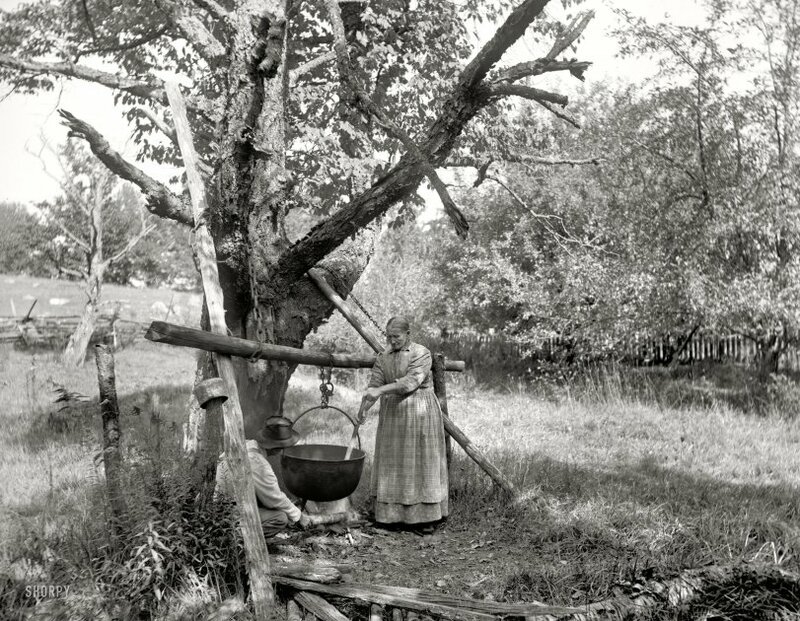 "A bit of country life near Henryville, Pennsylvania -- making soap." 8x10 inch dry plate glass negative, Detroit Publishing Company. View full size. Submitted by gblawson on Mon, 08/08/2011 - 4:46am. A number of years before her death (at 97), I asked Mom to write her account of growing up in rural Ontario without running water or electricity. We ended up with quite an autobiography, including a section on soapmaking. All the soap used in the Shannon household was home made from materials at hand, fat and potash. The fat came from the pork which was a staple meat. The potash came from wood ashes from the kitchen stove. Near the back door was a round tank about 4 or 5 feet high and whenever the ashes were taken out of the stove they were put in this tank along with some water. When it was time to make the soap, the liquid, now lye or potash, was drained off through a tap at the bottom of the tank. Now the big iron kettle on the tripod came into service. Measured amounts of fat and potash were put in the pot and a fire was started under the kettle. I remember seeing Grandma Lou stirring the contents of the kettle and imagining she was a witch. Indeed she could have passed for one, long dark clothes, shawl around her head and shoulders, all she lacked was the pointed hat and broomstick. After several hours of boiling and stirring the soap was finished, the fire allowed to go out and the soap to set. On top would be about 4 inches of lovely white soap which would be cut into bars and used for hands and baths and laundry. Below was about 2 inches of light brown liquid soap, called soft soap. This was put in a bowl beside the wash basin in the woodshed for the workmen (just Grandpa by this time) to get the real grime off. Below the soft soap was about 1/2 inch of glycerine. This was mixed with rosewater (the only purchased item) to use as a hand lotion to repair the damage done by the soap. My mother carried on the tradition of soap making on the kitchen stove, but she bought the lye in cans to mix with the fats which she had carefully saved. I do not remember there being soft soap and glycerine as a byproduct. Submitted by Dave on Sun, 08/07/2011 - 10:08pm. Submitted by Glocke380 on Sun, 08/07/2011 - 5:36pm. That's what you call that dead limb hanging up there, at least up here in the northwest, because they often fall on the logger while cutting down a tree, I guess that one would be a "widower maker"! Submitted by downbythecreek on Sat, 08/06/2011 - 7:18pm. There's a very large, very dead limb hanging directly above her head! Submitted by Al-Thib on Thu, 08/04/2011 - 7:30pm. Now they haven't heard a word in years! Submitted by Bruce Lancaster on Thu, 08/04/2011 - 1:25pm. The relationship between money and time would have been very different on a small farm, which would have been largely a subsistence operation, with only a little money from selling surplus. Cash was likely reserved for things requiring too much tech to be practical like steel tools and cloth. Extra money required extra time to run something like a few beehives or extra laying chickens to produce something salable. Granny would have supplied the experience to get the recipe right -- too much lye, and the soap will clean you right down to the bone. Too little and you have grease. Submitted by delworthio on Thu, 08/04/2011 - 10:05am. I think she's standing a good foot or more away from the fire, based on how far out her left forearm would likely reach. Far away things tend to appear closer to each other than they really are and photography captures this illusion. Submitted by rgraham on Thu, 08/04/2011 - 9:30am. That's what I thought it said yesterday. Then I thought, man, they sure must have a big family. Submitted by Capn_Jack on Thu, 08/04/2011 - 9:03am. Obscure engineer Morris Goldberg (whose son Rube was later to achieve fame as a cartoonist) drew a Free Body Diagram of the beam that's holding up the cauldron. He concluded that additional reinforcement was needed, so he specified the two custom made sizes of iron chains shown. Well, it worked, didn't it? This photo is the proof. A print was found in Mo's briefcase after he passed on in 1947. Submitted by Maniak Productions on Thu, 08/04/2011 - 6:17am. Baby soap has to be mild. Possum fat and lye was Granny Clampett's recipe, I do recall. Submitted by fanhead on Thu, 08/04/2011 - 5:17am. The hem of her dress is awfully close to the fire. It's making me nervous. Submitted by Don Jay on Thu, 08/04/2011 - 3:50am. If the hem of Grandma's dress gets any closer to the fire she is going to be all "lit up." Submitted by captivated on Wed, 08/03/2011 - 9:59pm. Until I saw this, I never considered the purchase of a bar of soap to be a labor-saving act. It is good that soap is available in our stores since I have no idea of how to make it. The photo is dated 1900. P&G's Ivory Soap had been available since 1879. Perhaps it was considered an unaffordable luxury by some in 1900 - a necessity in today's world. I suppose underarm deodorant was not even considered. Submitted by aenthal on Wed, 08/03/2011 - 9:46pm. 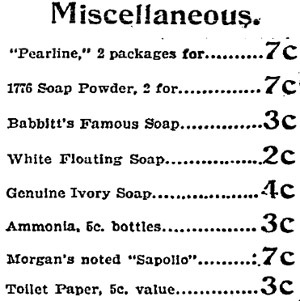 I could not find how much a bar of soap cost in 1900, but it had to be a few cents. Compare that to what must be an all day job: gathering the wood, gathering the fat and lye, setting the fire, melting and stirring the ingredients, cooling them, cutting the bars up, stacking them, then cleaning up and putting that cannibal kettle away. They are doing all that to save how many pennies? Doesn't make sense to brains and wallets 110 years later. Submitted by Vintagetvs on Wed, 08/03/2011 - 9:08pm. and move to Beverly? Hills, that is.